Juice recipes and cleanse programs for detox, well-being and vitality, from Plenish, a popular British juice brand. You are what you eat, and consuming fresh, raw juices is a delicious way to flood your body with nutrients, cleanse your system and cure your ills. 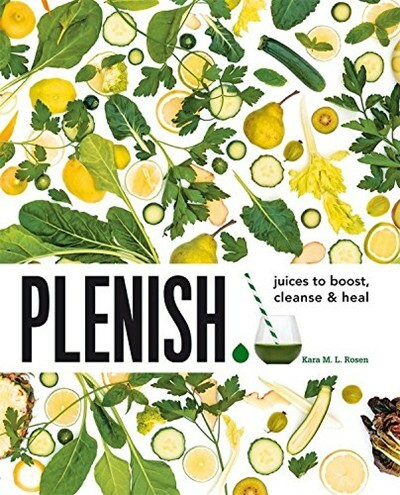 Plenish shows you how to make over 40 juice blends, detox with a cleanse program, heal your body naturally, fuel your system, fight disease, promote mind and body wellness, and lose weight in the process. From the Thai Melon Brightener to the Greenie Mary, each recipe will help your body to detox and rejuvenate, so that you can thrive. PLENISH Cleanse founder Kara Rosen spent a decade flying between New York and LA, jet lagged, overindulged and exhausted from a hectic work schedule. Suffering from an ongoing battle with strep throat, and failing antibiotics, Kara turned to a holistic nutritionist who suggested a 5-day juice cleanse. Having helped her to win the battle against strep, that cleanse turned into a love for a new lifestyle and Kara started to turn regularly to cold-pressed juices for a detox. After having her baby and moving to London, Kara started to prepare her own cold-pressed juices and nut milks. She worked with a talented nutritionist to establish the right balance of phytonutrients and protein in order to gently rid the body of toxins, and maintain the energy levels necessary for her busy lifestyle. After a year of making the juices for friends and family and receiving fabulous feedback, PLENISH was born to make organic, raw, cold-pressed juices available to everyone. It is now available nationwide in UK.